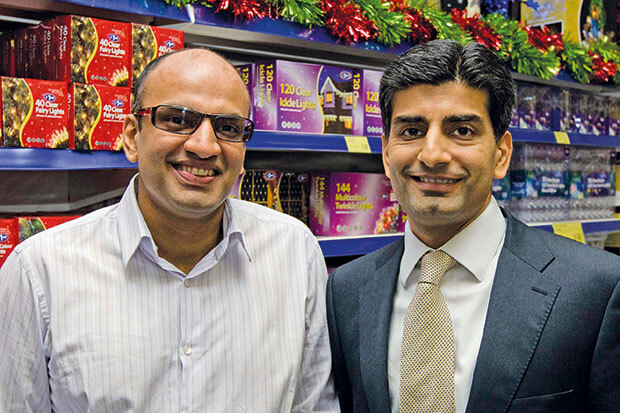 This year's top spot on our list goes to Simon and Bobby Arora, who've built their bargain homewares chain B&M into a billion pound success story. They are joined by entrepreneurs in everything from aviation and drinks to soft toys and software. If Britain is to continue to prosper amid the spreading shockwaves of the great China economic slowdown, it's going to need all the help it can get from its energetic army of entrepreneurs. Happily our 10th MT survey of Britain's Top 100 Entrepreneurs and family businesses shows that in the last five years, from the depth of the downturn until last year, the nation's self-made businessmen and women have been performing heroically, growing their operations, taking on staff and generating much-needed cash for both their local economies and the country. So our Top 100 have seen staff numbers shoot up by nearly 85,000 in the last five years to over 164,000. This near-107% rise is much sharper than in previous years, justifying the view that our best entrepreneurs are the economy's real job creators. And job creation is one of the crucial measures we use in ranking our Top 100. The other of course is turnover growth, reflecting the economic activity they generate. This year our 100 entrepreneurs had a total turnover of £26.35bn, up from £12.898bn five years ago. This represents a 104.3% increase - great news for UK plc, but perhaps a note of caution should come here. This is the first time since we started doing the Top 100 that the overall growth in employment has been greater than the comparable growth figure for turnover. It may help explain why the British productivity record has been so lamentable in recent years, with an 18% lag behind our competitors. Quite simply the entrepreneurs collectively are not getting as much out of each staff member in output terms. But behind the macroeconomic numbers are some pretty impressive individual performances, none more so than this year's number one - the Arora brothers (pictured) of discount homewares chain B&M. Simon, the Cambridge-educated ex-McKinsey man, and his younger brother Bobby, who has a market trader's nose for a bargain and pricing, have in the last decade built up a group that is now the envy of the discount retail world, valued by the stock market at around £3.2bn. More importantly for UK plc, in the last five years, B&M's remorseless expansion has seen its staff numbers jump by over 200% to 19,462. That must be a welcome boost in its Merseyside heartland where it has its headquarters. This is matched by their track record in growing sales, up by 206% in the same period. But they are not alone in this respect. Our joint second place entries, 32-year-old Nitin Passi of the Missguided online fashion group and the Coates siblings - Denise and John - through their Bet365 online gaming operation, are just as effective when it comes to expansion. Passi has invested in a new headquarters in Manchester which, with all the trappings of an internet operation, is regarded as the coolest in the city. He reckons it will motivate his growing staff to make Missguided a £1bn business in five years. Few would bet against him, or the nine others from Britain's thriving Asian business community who make our list. Excellent progress this may be, but sadly we can't say the same about the number of female entrepreneurs in the Top 100. There are 17 women listed, but only two, including Denise Coates of course, make the top 20. Last year's celebrity winner, fashion entrepreneur Victoria Beckham , has not produced any new accounts and so cannot be considered this time around. There are of course some fabulous women entrepreneurs who have developed businesses of the scale to make it into the Top 100, including Chrissie Rucker of the White Company, Margaret Barbour and Vivienne Westwood . But despite having trawled Companies House for the accounts that provide the underpinning of our research, there are just not enough. Perhaps this is a deficiency which the current crop of twentysomething female entrepreneurs like Kathryn Parsons of Decoded and Smruti Sriram of Supreme Creations will address in future lists - after all, the wealth which is one of our core criteria typically takes many years to accrue. In the meantime, the aforementioned Bet365 founder and co-CEO Denise Coates is our highest placed woman and flies the flag ably for women in business. A bookie's daughter, she certainly knows a good bet when she sees one. Coates has masterminded a near doubling of profits to over £400m in the Stoke-based firm's latest accounts. And her business acumen extends to looking after her employees, too - she plans to turn what's left of Josiah Wedgwood's famous Etruria Works into a children's day nursery, a facility bound to be welcomed by the firm's working parents. The north-south divide may be ever-present, but encouragingly there are a fair crop of regional entrepreneurs working to close it. The South West has 14, the North West 13 and Yorkshire 12. But the South East still remains top, with 33 names. Encouragingly for the government's efforts to re-balance British business towards manufacturing, the march of the Top 100 makers is going at full tilt. Thirteen of the Top 100 are industrialists of one sort or another, with another 21 in high-tech sectors like the internet, software, telecoms and computing. They include Sir James Dyson of the ubiquitous bagless vacuum, whose firm is rapidly moving into new markets. Smaller but growing steadily are the likes of Melett, built up by Ian and Nicola Warhurst, which makes turbocharger repair kits for cars, and exports 90% of its output, with a growing market in China. One of our measures of how well our entrepreneurs are doing comes from a valuation of their stake in the business and other assets, based on the stock market values if quoted or in line with those values for those who run a private company. Such valuations, of course, come with many caveats but serve as a rough and ready guide. Collectively the Top 100 are, by our reckoning, worth £24.5bn, a whisker below last year's £25bn total. This may reflect the general fragility of markets worldwide at present. But the one fact that unites all our 100 is their demonstrable record of success. They are the best hope for Britain to enjoy a sustained recovery with more jobs - and more prosperity - to come.